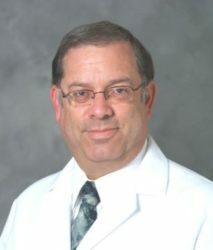 David S. Weingarden, M.D. - David S. Weingarden, M.D. & Associates, P.C. 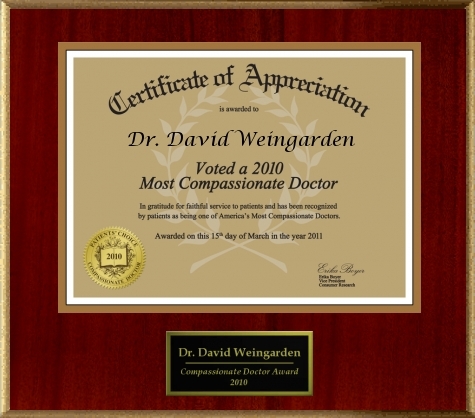 Dr. David S. Weingarden holds many positions and titles. Dr. Weingarden is the sole Founder and Medical Director of our medical group, as well as the Founder and Medical Director of the Henry Ford Macomb Hospital, Department of Physical Medicine & Rehabilitation and Inpatient Rehabilitation Center. Dr. Weingarden holds the position of Founder and Medical Director for many other programs including; The Neuropathy Institute, The Macomb Post-Polio Clinic, The Center For Physical Medicine, and a number of other programs. Growing up in southeastern Michigan, as a national MENSA member, Dr. Weingarden attended Wayne State University, receiving a Bachelors of Science in Biology with High Distinction and Honors in 1979, and was inducted into the Phi Sigma National Biological Honor Society. In 1983 he was awarded a Doctorate of Medicine. In 1987, Dr. Weingarden received Board Certification in Physical Medicine & Rehabilitation. Since coming to Macomb County in 1986 and becoming Medical Director of the Department of Physical Medicine and Rehabilitation, Dr. Weingarden has brought state-of-the-art Physical Medicine & Rehabilitation care to the region. Dr. Weingarden developed and headed Metropolitan Detroit’s first Post-Polio Clinic, and Macomb County’s first bracing and amputee clinic. The Doctor developed an occupational medicine “Work Hardening” program, and northern Macomb County’s first Inpatient Rehabilitation Unit. A popular lecturer on various medical topics, Dr. Weingarden has made education one of his prime goals. Dr. Weingarden served as interim Chief Medical Officer and Vice President of Medical Affairs at St. Joseph’s Healthcare, and as of January 2006, Dr. Weingarden was honored with an appointment from the Governor of the State of Michigan, to serve on the Michigan Board of Medicine, and served in that role until 2014. In January of 2007, Dr. Weingarden was again honored with an appointment by Governor Granholm to the Joint Task Force for Health Professions in Medicine and Osteopathic Medicine & Surgery, aka “The Michigan Task Force on Physician’s Assistants” and served in that role until 2011. 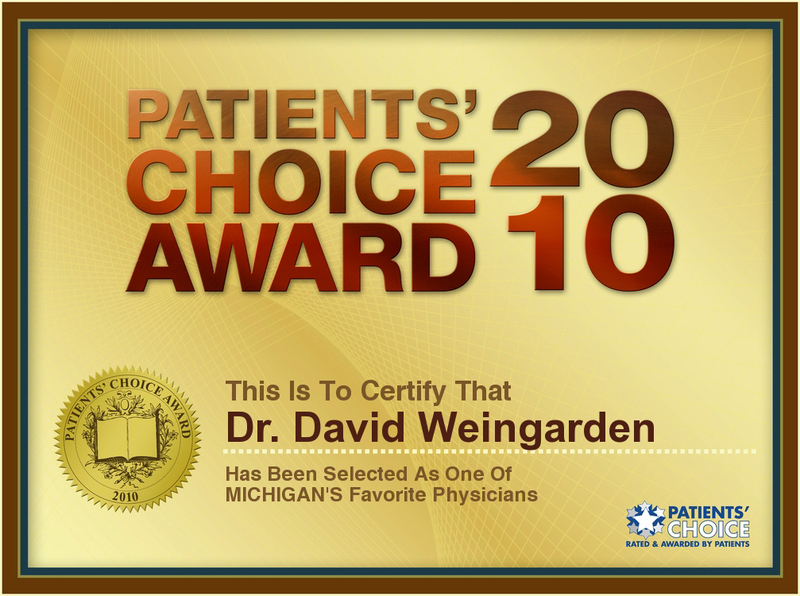 Over the years, Dr. Weingarden has been awarded many awards, beginning with the 2010 “Most Compassionate Doctor” Award as well as the 2010 “Patient’s Choice” Award, and then most recently receiving the “Top Rehabilitation Physician” award in 2015, and the “Top Doc Award” in 2015 and 2017. Dr. & Mrs. Weingarden are blessed with a large family with grandchildren. The Doctor notes that “people” and “helping others” are his main hobby and favorite pastime. Doctor Weingarden states that his goal has always been to treat the patient as a “whole person” not just as a disease; to partner with each patient to solve their problems, and to always treat the patient with dignity and respect. Dr. Weingarden has recently been awarded “A Top Physiatrist Award” by the International Association of HeathCare Professionals (IAHCP) in 2018. And is spotlighted in The Leading Physicians of the World publication. Dr. David S. Weingarden, M.D. by Leah G. on Dr. David S. Weingarden, M.D. I have seen Dr. Weingarden on numerous occasions. He always greets me with a smile on his face and gives me his full attention to address my needs and concerns. I highly recommend him to all my friends and family. He has my utmost respect. by Daniel W. on Dr. David S. Weingarden, M.D. Dr. Weingarden is an amazing doctor. He carefully hears you out and figures out whats wrong! Nice with a sense of humor:) Would definitely refer him to everyone.